Massages increase serotonin, oxytocin, and dopamine, contributing to an overall feeling of joy and intimacy. If you get a massage with your partner on Valentine’s Day, you’re sure to have a joyful and relaxing time together creating a closer bond between the two of you. Our couple’s massage allows spa guests to indulge in a side-by-side Swedish massage with your choice of champagne or fruit infused water or organic herbal tea, chocolate truffles followed by a rose petal foot bath, personalized aromatherapy and a deep, soothing massage using long, relaxing strokes and romantic essential oils. Call us selfish, but is there anything better than giving a gift that you also get to benefit from? A couple’s massage is the perfect way to ensure that you both have a great experience this Valentine’s Day. Rather than purchasing candy or jewelry, a couple’s massage is a memory that you both will fondly look back at and know your Valentine’s Day was well spent. 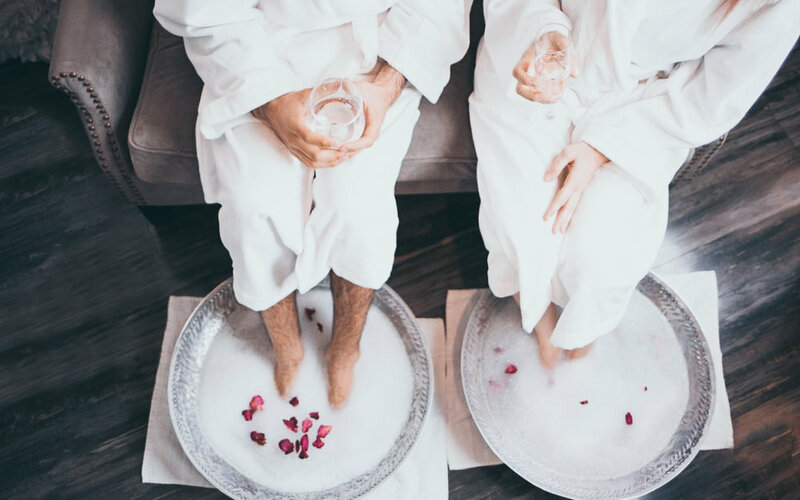 Unlike going to dinner on Valentine’s Day or partaking in other busy date activities, a couple’s massage at Spa Kingston allows you to check out from reality and escape to a relaxing retreat with your partner by your side. The whole point of Valentine’s Day is to spend quality time together, and by getting a couple’s massage you are able to do exactly that – and with privacy! We know Valentine’s Day can be stressful so skip out on all the craziness of gift shopping, restaurant reservations, and common dates, and opt for a couple’s massage at Spa Kingston! From February 13-19th we’re offering couple’s massage for $175 with a $25 credit towards your next booked service. It’s the perfect time to book your Valentine’s Day date and start relaxing with your loved one! You can also enter to win a couple’s massage for free by sharing this blog post or by tagging your loved one through our social media giveaway! We look forward to helping you celebrate Valentine’s Day in the best possible way! Book your couple’s massage here.